Abby Loveys wasted no time making her presence felt. The Princeton University-bound Loveys, who finished 11th at the Foot Locker XC Nationals last month, split 5:00.1 in her season debut to bring Randolph across first in a red-hot girls distance medley relay in a NJ#1/US#3 12:24.38 at the Morris County Relays at Drew University in Madison on Tuesday night. West Morris finished second in the DMR in a NJ#2/US#5 12:31.53. 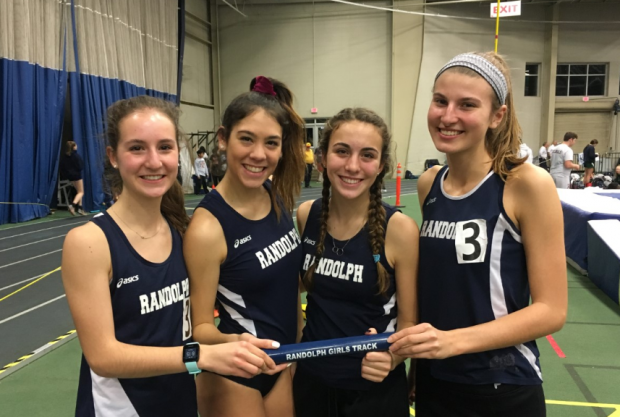 Junior Meredith Finley led off the DMR for Randolph, which won the girls team title, with a big indoor PR of 3:46.3 on the 1,200 leg. Sophomore Claire Doto followed with a 65.6 400 carry, and then junior Amanda Houston split 2:32.1 on the 800 leg. Loveys, the NJ Meet of Champions winner in the 1,600 last spring and in XC this past fall, grabbed the baton even with Julia Trethaway of West Morris and gradually pulled away to finish seven seconds ahead of Trethaway, who split 5:07 and change. Trethaway, a junior, is NJ#1 in both the 1,600 (5:02.33) and the 3,200 (10:52.98). The Mendham boys also went US#3 in the DMR running 10:38.65 for the win! There are four boys teams under 12:50 in New Jersey so far this season. Article was written before the end of the meet. Below are some of the other highlight performances. 11 performances met the MileSplit US Second Team standard.